The current issue (No.52) of Green Magazine takes a look at our Rose Bay garden with a view - a new lease of life for a retired swimming pool. Barbara Landsberg: As seen on TV! We're delighted that Barbara and her labour of love, the gardens at Withycombe in the Blue Mountains, were made the subject of a wonderful interview with Costa Georgiadis from Gardening Australia. “Nature is but another name for health” is an apt quote we came across here in the studio from Henry David Thoreau as we were studying his work as inspiration for a garden we have been designing recently. Even though we are lucky enough to work with gardens and our natural world, we can also get ‘stuck at the office’ and Thoreau’s quote reminded us how big a difference an hour in the garden, a walk in the park or that longer trip away to the country can make to how we feel; especially after a busy working week - and particularly felt at this time of year! The constant bombardment of technology and media, busy cities and busy lives result in over stimulation, fatigue and illness. The green spaces of our gardens, parks and countryside are critical in helping us to wind down, soothe the mind by providing quiet places to sit and contemplate, beauty, smells and textures, stillness and, whether you are aware of it or not, an environment that is living and energetic. So whatever time you can get use it to head out into your garden – or take a walk in the fresh air and be in nature a while. The concept of reflection helped guide the design of a small garden we recently finished in Randwick. The house is a quintessential Sydney federation home which had just undergone a major renovation with clean-lined, modern new interiors. We needed to create a beautiful, classic garden that honoured the old architecture and gave the house an appropriate and harmonious setting, yet had a clarity and simplicity that spoke of the new incarnation. ‘Reflection’ was the guiding concept – a mirroring of the detail of the formal, federation architecture, a strong, reflective symmetry across the garden as each side reflected the other and gave the front area strength and balance, the clarity of line in the design reflected the new era of the home and modern interiors. 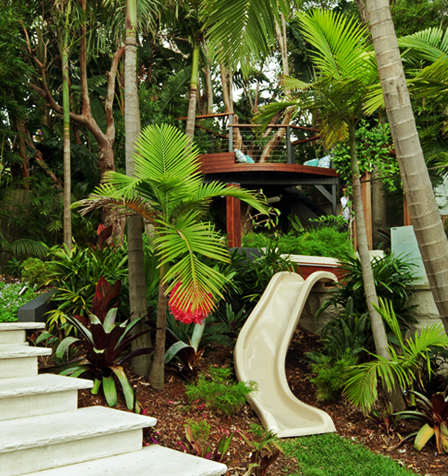 The design of the garden was also a reflection of the owner’s preferences and wishes. Reflection also guided other details in the garden, such as the lighting, materials we chose and how the plants and materials affected the light coming into the house. Different materials and plants have all sort of different reflective properties to consider when designing with them. Gardens have been well known for their medicinal properties throughout most of our history. In ancient times, plants were our first medicines and healers and so gardens were planted purely for these reasons - Every living thing contributed something. We were in tune and connected to our earth as each living plant contributed to our lives and we understood and respected the contribution: trees for fruit, building material, shelter and protection. The habitat of the animals, insects and birds. Plants for food – cereals and fruit, herbs and tubers. Meat was a luxury and the plants provided the staple diet. Medicines – plants were our (almost sole) medicines. Each plant has a known medicinal quality – some toxic, some aphrodisiac, antiseptic, antispasmodic – a hundred medicinal qualities made into balms, ointments, compresses, tinctures, teas to name a few. Our relationship with plants was first one of reliance and respect. We understood the plants in our environments and knew their whole, full nature. The beauty of a flower was incidental to the role its full nature played. Elements derived from plants and living organisms are still the major ingredients in most of our modern drugs – sometimes synthesized and sometimes still obtained from the actual plant. But, as milk appears on the supermarket shelf in a bottle and we forget the cow, and vegetables appear on the supermarket shelf in a plastic box and we forget that this is a living item which has most likely been grown in the open air in a field, we forget the analgesics we buy in the plastic and foil packet from the chemist is derived from a plant source - Papaver somiferum. Still, indigenous communities around the world are connected to their living world of plants, understanding their critical value as food, shelter, medicines and in this sense, they still very much benefit from a rich connection to the living world and feel a part of the same energetic systems as their living environment. We have reduced plants to only how they look, strange parallels to people as we have reduced people’s value to first and sometimes only their appearance. Yes, we value plants for their beauty and form, but they are far richer and more complex and can be understood and respected – and their contribution to our lives extended if we remind ourselves of their true nature. Here's a great article showcasing our project for 'Uspace', a facility within St Vincent's Private Hospital for Young Adult Mental Health. It was published this month in Landscape Outlook which is put out through the Journal of the Australian Institute of Landscape Designers and Managers (AILDM). This was a wonderful opportunity for us to really witness the therapeutic benefits and healing nature of a well-designed garden. A well thought lighting design can completely transform not only the exterior of the built form of the house itself but moreso, enhance the character and personality of the garden, giving shape to the darkness. We have been working on designs for a large, sprawling garden down in Berry recently and have undertaken a lot of research on garden lighting. Its been wonderful to discover some of the ways lighting can be used to transform a green space into a magical place to be enjoyed not only during its natural daylight setting but also throughout the evening. 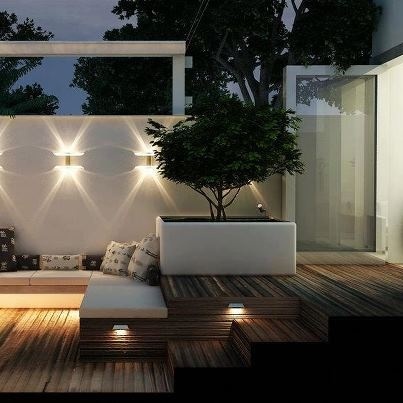 Being able to extend the enjoyment in your garden into the evening is really exciting and provides opportunities to play with shadows which can be cast by foliage, sculptures and other garden structures; highlighting feature items such as urns, water features, sculptures as well as practically, by providing guiding light for pathways, steps and lighting to areas for alfresco dining, barbecue lighting. A well thought lighting design can completely transform not only the exterior of the built form of the house itself but moreso, enhance the character and personality of the garden, giving shape to the darkness. Knowing that there are so many wonderful low-voltage outdoor lighting options available to us gives us freedom when designing a space to think about it in two distinct states - night and day. As usual, we love a bit of Pinterest for inspiring pictures! We've been exploring the concept of place in our research around creating a village centre for the small historic Mount Wilson community in the Blue Mountains. So what are some of the things that define 'place'? Is it about a particular location or environment? What are some of the cultural determinants we need to consider, both old and new? Great little diagram resource from Project for Public Spaces website we found - perfectly defines a successful public space. Part of what we value as garden designers is the the role that both a garden, and we as designers play in promoting wellness and healing. We have been working on a great family garden recently and thinking about the importance of 'play'. Play is not only an essential activity for children, but it can be important source of relaxation, healing and stimulation for adults as well. The act of 'playing' is something which can contribute to one's overall mental and physical wellbeing as well as fostering important relationships with our loved ones. Of course our gardens can provide the perfect environment and the possibilities are exciting! Imagine yourself swinging from a lovely rope swing or day bed, sliding into a pool, sitting up on a platform amongst a tree canopy with a picnic or even just playing hide n seek in amongst the foliage. What kind of other great play things have you dreamt of having in your garden? The wonderful Heatherwick Spun Chairs we worked into our design for the Uspace courtyard at St Vincents Hospital, Sydney. Uspace is a mental health clinic for young adults. The chairs are alot of fun, naturally encouraging a sense of joy, movements, openness and trust in both patients and staff! Then they fell in drifts and droves and so fell many more. The 'Flower of Life' is an ancient geometric symbol which we came upon during our research for the USpace courtyard. Throughout history, the tessellating pattern of circles has had relevance to the natural world around us. It has provided us with explanations on how things work, from the human body and the makeup of plants to distant galaxies. Even molecular and cellular structures are based on this principle (the first cell divides into two cells, then to four cells then to eight). The symbol itself is created with one central circle onto which a series of identical circles are added to create an interlocking pattern. The overlapping circles resemble 'petals' and multiply and burst into a larger circular flower shape. The perfection of the greater circle and the smaller circles within it work beautifully together to form something unified and strong. Given the project was based in a mental health facility for young people, the form and ideas behind this pattern resonated with us, reiterating the importance of the individual and the communicant and the individual within that community. The symbol made its way into our design very early on, when we were researching and developing design concepts, we came across the 'Flower of Life' time and time again. Conceptually, it tied in with what we were trying to achieve so perfectly and we could see it could have lots of applications and give the space a sense of calm, security, and, like the chairs, further promoted a sort of 'opening up' within the patients. Additionally and importantly, we knew it would give the garden a sense of wholeness and provide us with an overall guide in our design process. And of course we couldn't have done it without the amazing design and engineering skills of the wonderful Duncan and Natalia from Broadcroft Design. Once again they cleverly interpreted and tackled our design brief and incorporated the 'Flower of Life' on the love bench seat for our USpace Youth Mental Health courtyard design at St Vincent's Private Hospital. Not only has it been perfectly cut out of the timber seat, but it also casts a most gorgeous shadow underneath, just to to top it off! It is always a moment of faith when the plants go in as small youngsters, trusting that they will grow to the stature and glory that is first envisioned. It was 18 months ago, that this Vaucluse garden was finished and the design process itself stretched over three years as the house was built and various challenges encountered along the way. The garden was a collaboration with Ian Arkins of Arkins Landscapes. It was a real joy to open it up as part of the ‘Hidden’ open garden last weekend, a weekend organised by Australian Open Garden and AILDM enable Sydney-siders to come and look at many private gardens across Sydney. Special thanks to our very patient and generous clients who took their four children and dog away for the weekend, entrusting the garden to us. We can get lost in the practical aspects of our gardens - the drainage, plants that die, plants that grow too big, where the hose might be stored neatly, lawns that need cutting, weeds that need pulling out, dead patches of, well, anything. Can you stand still, or better, sit still, within your garden, breathe deeply and appreciate everything that it is instead of what it is not? Can you stop and close your eyes and allow it to ground you? Often, people say to me, "Oh, I cannot invite you to my house because you will see how terrible my garden is." This always makes me laugh because a garden is a garden - it is a place of the earth where the sun and shadows move, where things grow quietly, even if they are the weeds, where the breeze touches you and where there might be some peace. Gardens are like us, they never fit anyone's idea of perfect but they all have their own aspects of beauty. Grab a chair and five minutes and enjoy it exactly as it is. A quick tip on watering your garden: pay attention to what you are doing. Waving the hose about, spraying everything with a nice, light shower is both barely helpful for the plant and a great waste of time and water. Water sprayed about lightly does not penetrate to the roots of a plant, it mostly sits on the leaves and surface of the soil or mulch and then evaporates. 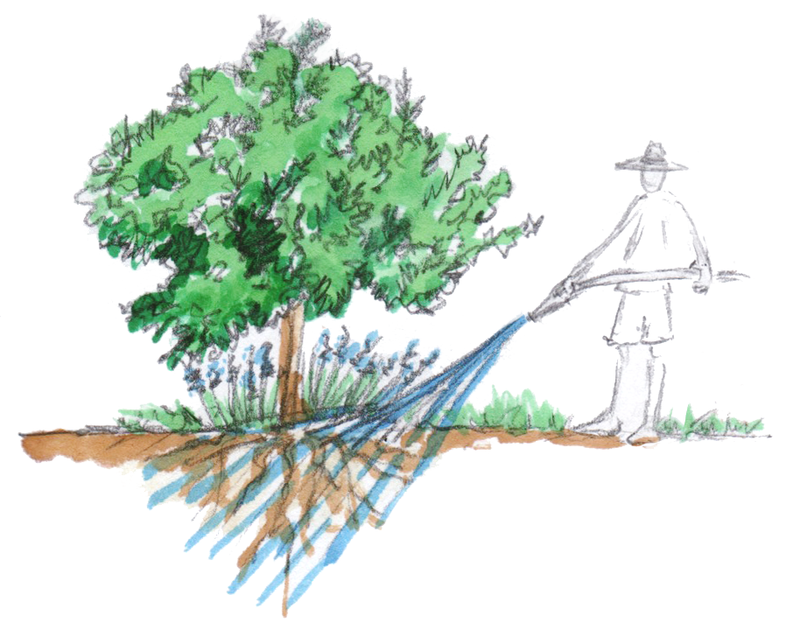 If you are going to water, pay attention; aim a steady flow of water to the roots of each plant for enough time for the water to sink deeply into the soil around the root system - this could be several seconds per plant. If you water each plant long and deep, you will only need to water every few days rather than every day. The afternoon sun is pouring into the new studio, filtered through camellia and boston ivy. It's beautiful and peaceful. Proper bookshelves will be in next week and then I could not think of a more perfect place - surrounded by peace, plants and garden books!